Take a closer look at rule changes both dramatic and mundane over the past decade, and you'll find a common thread: the desire to slow down Nick Saban's machine. You'll find a common result, too: Saban and the Tide keep on winning anyway. Plus, the transfer carousel continues to turn, Florida's barbecue chains are put to the test and the rest of this week's Punt, Pass & Pork. Major college football can’t have a commissioner because schools colluding to cap the compensation of their athletes can’t very well hire someone to be in charge of said collusion while they’re being sued in federal court. But if there comes a day when it is possible to hire a college football commissioner, that commissioner should be Paul Johnson. The Georgia Tech coach spent a portion of last week’s ACC meetings chuckling as his colleagues discussed the potential impact of a new NCAA rule that will limit the number of people allowed to wear headsets on gameday to 20 per team and the number of sideline passes to 60 for each team. Johnson’s operations director informed him that the Yellow Jackets only use 17 headsets on gameday, so the rule won’t affect him at all. Still, he cracked that it should go further. “How about no headsets?” said Johnson, an option coach who might suddenly find himself with an advantage if it wasn’t so easy for opposing coaches to communicate. (When those words left Johnson’s lips, the agent for notoriously headset-averse coach Brady Hoke probably sprung into action to try to get the Carolina Panthers’ defensive line coach back into the college game.) Johnson couldn’t help but make fun of the rule, because he knows why the rule was passed. And he also knows it isn’t going to matter. Why did the NCAA’s football oversight committee make this rule, and why did it get rubber-stamped this month by the NCAA’s Playing Rules Oversight Panel? Because of Nick Saban. And just like every other rule designed to slow the march of Saban’s team toward more national titles, this one will fail to achieve its intended purpose. Ever since coaches and administrators realized that Saban might be the most prolific job creator in Alabama, the less imaginative among them have tried to figure out how to keep Alabama from hiring every person who has ever watched a Hudl clip. This, those coaches and administrators contend, will finally be the magic bullet that puts Saban’s Alabama on the same playing field as former employer Toledo. In the process—no pun intended—perhaps Saban disciples such as Georgia’s Kirby Smart and Texas A&M’s Jimbo Fisher will find themselves hamstrung as well. They also tend to win a lot of games when given resources and turned loose in fertile recruiting areas. Athletic directors know the schools shouldn’t make an NCAA rule capping staff size because the NCAA will get slaughtered in court the way it did when the schools tried to cap assistant coaching pay in certain sports. It’s one thing to allow only 10 on-field assistants or five full-time weight room staffers. There are still other jobs in the organization. But the moment the schools use an NCAA rule to attach a finite number to the jobs available in an organization, they’d become an easy target for an antitrust suit because they’d be colluding to cap the number of available jobs in a particular labor market. But don’t worry, they have a solution. HEADSETS. The days of Saban’s dominance apparently are over because only 20 people can wear a headset that only gets three channels (offense, defense, special teams), on which only four people (head coach, offensive coordinator, defensive coordinator, special teams coordinator) usually are allowed to talk. (It’s actually 19 headsets because the phone that allows the quarterback to talk to a coach in the press box also counts as one.) Before we eulogize the end of this era, let’s take a look back at the rules that have been passed specifically because of Saban and count how many national titles Alabama has won since their passage. Head coaches aren’t allowed to go on the road to evaluate prospects in the spring anymore. This was a direct response to Saban’s first full recruiting cycle at Alabama, which resulted in a No. 1 class. *Urban Meyer, then at Florida, was the other target of that rule. Meyer has won two national titles (one at Florida, one at Ohio State) since the rule was passed, meaning the targets of this rule have won seven of the past 10 national titles. Way to level the playing field, boys. This was a necessary set of rules passed by the SEC to keep some of the league’s coaches—including Saban—from signing players when they didn’t actually have scholarships for them. This set of rules also curbed the practice of medically disqualifying players whose malady was not being good enough to keep occupying a scholarship. (Thus allowing to keep giving the player a scholarship but freeing up a spot to sign a newer—and hopefully better—player.) But while the non-oversigning coaches in the SEC assumed this would stymie Saban at least a little, he began cranking out titles at an even faster pace. Wait, this one wasn’t designed to stop Saban. This was one pushed by Saban to slow down hurry-up offenses by forcing offenses to wait at least 10 seconds between the start of the play clock and the snap of the next play. When this proposed rule change got tabled, Saban simply sped up his own offense. Even when the rules he wants fail, Saban keeps winning titles. The Crimson Tide can no longer use former players such as Blake Sims or John Parker Wilson to run the scout team. They’ll have to settle for four- and five-star recruits. This one is going to the one that finally gets him, guys. I’m sure of it. Mr. T (born Laurence Tureaud) turned 66 on Monday. So it’s time to rank the members of the A-Team. Tagovailoa’s performance in the second half of the title game helped Alabama win a national title, and it also created an intriguing quarterback dilemma. Neither Tagovailoa nor incumbent starter Jalen Hurts has redshirted, meaning one could leave before this season begins and preserve all his remaining eligibility for another school. Hurts’s father already has suggested Hurts might transfer if he doesn’t win the job. Tagovailoa’s comments last week confirm what has been floating around Tuscaloosa for months—that he’ll consider a transfer if he isn’t the starter. That leaves Saban in an interesting position. The most powerful coach in the sport probably isn’t going to let two players dictate his timetable to decide a starter, but if it appears obvious during camp that one has the inside track on the job, the other might leave. This continues to be the most fascinating offseason story in college football. 2. Former Ohio State quarterback Joe Burrow will enter the competition for the starting job at LSU. Burrow has graduated, so he can play immediately. He has two seasons of eligibility remaining. In other quarterback transfer news, former Alabama and Arizona State quarterback Blake Barnett has landed at South Florida. 3. USC cornerback Jack Jones will miss the 2018 season because of academics, J. Brady McCullough of the Los Angeles Times reported Friday. Jones led the Trojans with four interceptions last season. Georgia quarterback Jake Fromm went fishing in south Georgia on Friday and hooked a 225-pounder. No. Black bass don’t grow that big. Few diners loathe chains more than barbecue fanatics. The idea that someone could open 50 or 100 of the same place and satisfy the unique desires of each community for pulled pork and/or ribs and/or brisket seems laughable. That attitude pervades because—unlike burger chains or steakhouse chains—barbecue chains have been mostly terrible for decades. In Florida, the dominant chain is Sonny’s. Those of us who grew up with Sonny’s have a rather complex relationship with it. 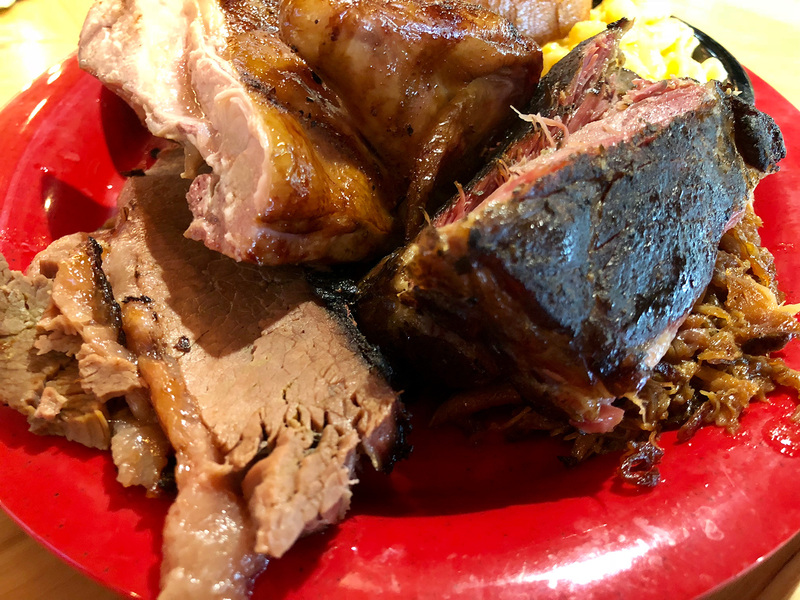 We knew we weren’t eating the best barbecue, but the place did serve smoked meat at a reasonable price and it didn’t get clogged with a line every day at lunch or only open three days a week. As someone who loves barbecue, I’m ashamed to admit that I’ve probably eaten at Sonny’s more times than any other barbecue restaurant. But the vast majority of those meals came between the ages of seven and 22. I’ve only been a handful of times since college, and I probably hadn’t eaten at one in 10 years before last week. Sonny’s celebrated its 50th birthday on May 16. In honor of that, I decided to give the chain another chance. But that chance also would include a challenge. 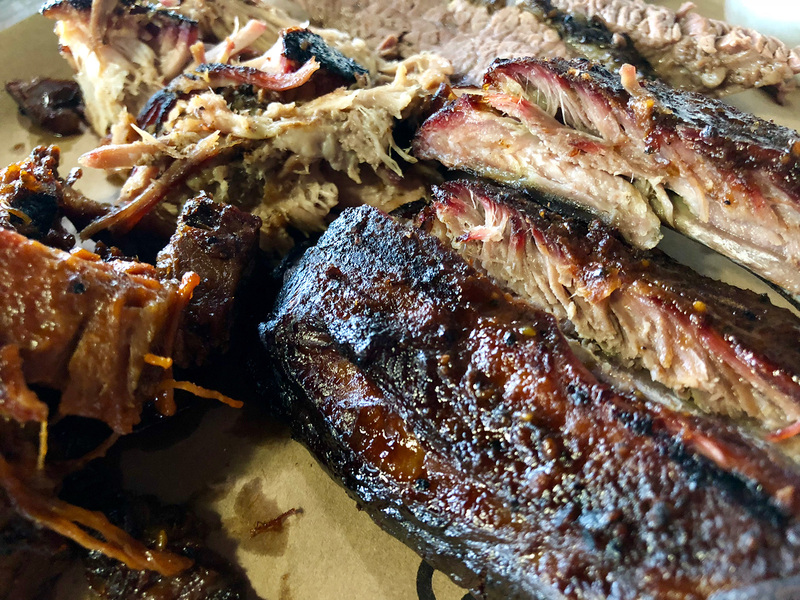 Another Florida-born barbecue chain has expanded throughout the state, and every new location 4 Rivers Smokehouse opens offers more proof that chain barbecue doesn’t have to stink. Had the rise of 4 Rivers—as well as Alabama-born Jim ’N Nicks, which might be even further along than 4 Rivers in blowing up all our preconceptions about chain barbecue—forced Sonny’s to raise its game? Or would it be the same slop I ate when I was in high school when I didn’t know any better? As fate would have it, there is a Sonny’s across the street from a 4 Rivers in Gainesville, Fla. Restaurant Row on Archer Road would be my testing ground. Sonny’s was born in Gainesville, but I intentionally avoided the original on Waldo Road because I wanted a satellite location for the purposes of this test. Sonny’s has restaurants in eight southern states, but it remains most heavily concentrated in Florida. Competitor 4 Rivers started in the Orlando suburb of Winter Park in 2009. John Rivers was an executive at Johnson & Johnson and ran a smaller pharmaceutical company before he decided that the barbecue he cooked for church fundraisers should become his job. When the original 4 Rivers opened, it instantly became the best barbecue joint in Florida. But it didn’t take long before one popped up in Winter Garden. Then in Longwood. Then two hours away in Gainesville. Then in Tallahassee. The chain now has 14 locations, including its first out-of-state venture in Atlanta. As it has grown, the faithful who had their first taste in Winter Park have said the same silent prayer: Please don’t become Sonny’s. But I secretly hoped 4 Rivers had pulled Sonny’s in the other direction. As much as I’ve criticized Sonny’s food through the years, I’ve made some great memories there. As I parked at the Archer Road location last week, I thought back to the time I challenged the readers of my Heaven Is a Buffet column in Florida’s student paper to a barbecue-eating contest. A student who had just finished a hitch in the Army beat me 15 plates of pork to 13, slammed his fork down and said “I’M STILL HUNGRY.” I was parking where that contest had taken place. A few years ago, they tore down that Sonny’s and built a new one in the old one’s parking lot. The new one is wrapped in dark wood. Stacks of split logs in iron racks decorate the interior. Some consultant got paid a lot to choose touches that convince diners of the place’s authenticity. Sonny’s had to do that, though. Because the 4 Rivers across the street is also decorated with wood and metal and looks like a smoke-tinged gastropub. His place may have a mom-and-pop story and may serve the brisket of a true believer, but Rivers also is a businessman. He consulted with restaurant professionals before he opened the original and had an eye on expansion early. Essentially, he had spotted an underserved market (consistently good barbecue produced on a large scale) and decided to serve it. If you’ve been reading this space long enough, you know it’s time to dispense with decor comparisons. The vibe doesn’t matter. The food matters. So how did 4 Rivers and Sonny’s compare head-to-head? The best thing about 4 Rivers is the quality hasn’t dropped from the original. On my first visit to the Winter Park location in January 2010, I ordered the smoked prime rib special because I’d never tried smoked prime rib. The man working the cutting board turned me away from that order. “We smoke brisket here,” he said before slicing into the fatty end of a brisket flat to reveal beautiful bark and a red smoke ring. I changed the order to brisket and ribs. Since then, I’ve had brisket, pulled pork, spare ribs, beef rib, burnt ends, smoked wings and tri-tip at various locations. It’s almost always great. Last week’s test was no different. I ordered the Pitmaster Combo (four meats, two sides and a biscuit for $20.15) The pulled pork was juicy and full of bark bits and needed no sauce. The brisket isn’t quite as good as those early days at the original—when it rivaled the best places in Texas—but it’s still easily the best brisket in the state and doesn’t seem to vary from location to location. The burnt ends are fantastic by themselves, but they’re especially good on the days where the kitchen decides to build a sandwich special around them. The spare ribs are the most consistently excellent item on the menu. A sweet, spicy rub makes sauce completely unnecessary, and 4 Rivers sources ribs that have extra thick pads of meat on top. The sides continue to be wonderful as well. The bacon-wrapped jalapenos and the grit cakes are the ones that set the place apart, but 4 Rivers also makes fantastic green beans and collard greens. That’s what I had with the Pitmaster last week, and I left very impressed. At Sonny’s, I ordered the Sonny’s Sampler (Ribs, brisket, pulled or sliced pork and chicken with two sides for $15.59). There are two things to note here. The first is the price. It’s about $5 cheaper for essentially the same item at Sonny’s. While it has become trendy to eat barbecue and to serve an elevated version of it, this also has coincided with rising meat costs that threaten to price out the people who grew up eating barbecue because it was cheap and readily available. Sonny’s seems to be working hard to keep the price down, which is good for the traditional barbecue customer but not as beneficial to the taste buds. The other interesting factor is the choice of sides. While the selection isn’t as broad as it is at 4 Rivers, it beats the old days, when you picked two out of the following three items: crinkle-cut fries, baked beans, cole slaw. I chose green beans and macaroni and cheese, and both were superior to the usual Sonny’s sides of my youth. If Sonny’s has worked harder to compete with the likes of 4 Rivers and Jim ’N’ Nick’s, it shows the most in the spare ribs. Sonny’s ribs used to have a rubbery quality that rendered them basically inedible. The ribs I had last week weren’t quite as juicy and didn’t have as flavorful a rub as 4 Rivers, but they were awfully close. (They were, however, a little smaller than their 4 Rivers counterparts.) I absolutely would order those ribs again. The chicken—my favorite item from my college days, when $5.99 got you all-you-can-eat chicken on Sundays—remained the best of the four sampler options. A smoked breast was thick and juicy, and though it didn’t need it, I drizzled on a few drops of sweet sauce just like I did when I was 20. Things took a dark turn when I got to the pulled pork. The default pork distribution method at Sonny’s was always sliced pork, which is weird. (Sonny’s offers the option to order pulled pork; I took that option.) Sliced pork dries out quickly and doesn’t provide as satisfying a bite as pulled pork. Also, pulled pork—the most popular meat throughout most of the Deep South—is the most difficult barbecue meat to screw up. Yet Sonny’s managed last week. But at least the pork, which came bathed in sauce, was edible. The brisket tasted like the meat in canned Dinty Moore beef stew. Only a few people outside of Texas are qualified to cook brisket, and this particular Sonny’s does not employ such a person. I came away happy that Sonny’s tries a little harder than it did in my youth, but given the choice between the two, I’m always going to pick 4 Rivers. In fact, given the choice between 4 Rivers and a lot of local, mom-and-pop places, I’m still going to pick 4 Rivers. Chain barbecue can be great, but it requires a company that demands excellence in every meal it serves. Sonny’s never was that kind of company, but maybe 4 Rivers is.